FORMER TAOISEACH BERTIE Ahern has said he tried his “very best to do the right thing by the Irish people”, apologised for his mistakes but added that he got “a lot of things right”. 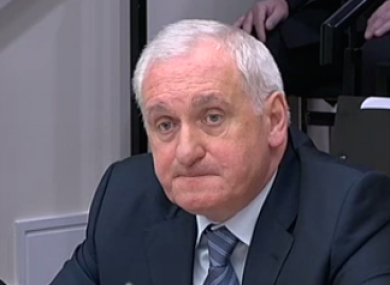 In his opening statement to the banking inquiry, Ahern said the last few years have been “extremely tough” on many families and added that it “breaks my heart”. Ahern said he wished the recession had not happened but added that it was “disingenuous” to say all of the gains of the economic boom had been washed away. Under questioning from Sinn Féin’s Pearse Doherty, Ahern admitted that parts of his opening statement had been taken word-for-word from his autobiography, saying his views have not changed. The former Fianna Fáil leader told the Oireachtas committee: “With hindsight of course, I would have done things differently. I did make mistakes, I admit that but so does everyone who governs. I know that during my time as Taoiseach, while I did not get everything right, I can honestly put my hand on my heart and say I did try my very best to do the right thing by the Irish people. Of course, I apologise for my mistakes, but I am also pleased that I did get a lot of things right. He paid tribute to his successor Brian Cowen and the late former finance minister Brian Lenihan and said he admired the efforts of the current government. “I think the Taoiseach, Minister Noonan and Minister Howlin have shown a lot of commitment and courage in tackling the financial crisis,” he said. The last few years have been extremely tough on many ordinary families and that breaks my heart, but the work of our democratic political system must prevail and the problems we faced on a massive scale of unemployment, emigration and the banking crisis, are on track to being resolved. Ahern said he “definitely” believed that the fundamentals of the Irish economy were sound when he handed over to Brian Cowen in May 2008. He said he was not aware of any proposals to guarantee Irish banks at that stage. Ahern also defended the huge increase in public spending between 2000 and 2008. He pointed out that only Estonia’s expenditure as a percentage of GDP was lower than Ireland’s in 2006 and 2007. I probably would have battened down the hatches in 1997 and said no to everything and therefore we would have been like Germany with huge budget surpluses. Ahern told the inquiry that it became apparent to him in 2009 that the tax reliefs on property that his government had introduced sustained the housing bubble. He later said the economy’s reliance on taxes from residential property – some 25 per cent of revenue – was “ghastly”. I don’t believe that personally I had much interaction with property developers. The former Fianna Fáil leader served as finance minister in the 1990s and as taoiseach between 1997 and 2008. We’ll be posting updates here. You can watch the proceedings on the livestream above or follow @TJ_Politics for live updates. Email “Bertie: If hindsight was foresight, I'd be a billionaire ”. Feedback on “Bertie: If hindsight was foresight, I'd be a billionaire ”.